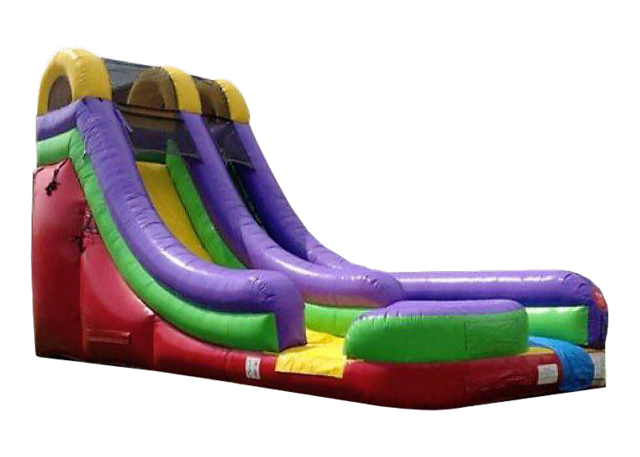 The attention-getting super water slide (WET) is sure to bring everyone running and keep them sliding at your next event! Participants can climb up 18 feet for a sleek and fast drop to make a splash in the cushioned bottom of this water slide, guaranteed to satisfy thrill seekers young and old. With a colorful red, green, purple and yellow theme, this water slide will match any theme or décor, and be an eye-catching attraction. Riders will enter the right side of the inflatable play structure and make the climb and slide down the left side of the water slide, ready to run around for a second turn. All you need to this water slide rental is add tables and chairs, snow cone machine and that's it... your stress free party is ready. Please don't forget that we also offer interactive games for rent. This water slide is also offer as an inflatable package deal. When you rent this inflatable water slide, YOU MUST PROVIDE A HOSE LONG ENOUGH TO REACH WHERE THE INFLATABLE IS GOING TO BE SET UP. Go ahead... see a video of this inflatable water slide.